My girlfriend Caroline and I headed out to the Goderich BIA Ladies’ Night Out. We have been attending this event together for the past few years. It is a bit chilly on this night but that doesn’t stop the many shoppers from getting in on the deals and supporting their local businesses. Over all 51 businesses part took in this event. Some included kitchen stores, book stores, clothing stores, a jewelry store and many more. Some merchants also provide yummy snacks like cheese and crackers, hot dips, sweet treats and a little vino too! Our last stop of the evening was at Riverline Nature Company. The store is located on 36 Kingston St and is open Monday-Saturday 10am-5pm. River Line Nature Company is a wild bird and garden store. It was created by wildlife biologist out of his frustration at not being able to find quality birdseed in the area. It is now owned by a local area resident. There is such a variety of things you can buy here. 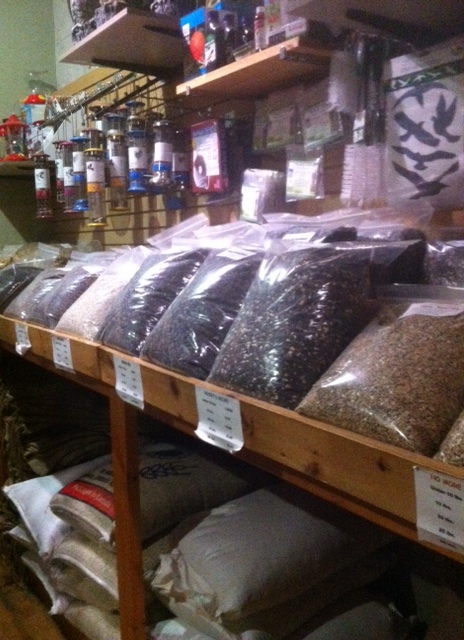 There are the many kinds of bird seed, walking sticks, books for animal lovers as well as great seed holders to help keep those squirrels at bay. You can even buy a fresh greens wreath here. Tonight I ended up buying a peanut feeder. My in-laws have one of these on their back deck and I always enjoy seeing the Blue Jays fly up and also have the squirrels get frustrated at not being able to get any treats. ← Still looking for Stocking Stuffers?